From Dec 2017 through Apr 2018, K2 Campaigns 16 & 17 will be able to monitor >20,000 galaxies to gather a statistical sample of the best supernovae lightcurves ever obtained. K2 will catch the critical first few hours of supernovae, allowing different explosion physics and progenitors to be elucidated. K2 will improve the calibration of Type Ia supernovae for cosmology by determining the key parameters needed for distance fitting. The fields observed will be visible from the ground, enabling simultaneous observations to complement K2’s single-bandpass photometry. Proposals to select and analyze K2 targets in C16 are eligible for funding up to $150,000 as part of K2 GO Cycle 5. The Step 1 deadline was Nov 3, 2016. A workshop was held at NASA Ames on Feb 14-16, 2017, to help plan the K2 Supernova Experiment, including the ground-based observations and data analysis efforts. Following a call for novel science experiments to be accomplished during K2's extended mission, feedback was received to enable a supernova survey in which simultaneous ground-based spectroscopic observations could complement K2’s single-bandpass photometry. A limitation that K2 supernova scientists have faced in previous Campaigns is that simultaneous observations from Earth required challenging observations during twilight. This will change in Campaigns 16 and 17, when K2 will observe fields towards the forward direction of its velocity vector, enabling galaxies to be monitored in a field that can easily be accessed from the ground at the same time. The large sample of supernova light curves expected from this experiment will improve the calibration of Type Ia supernovae for cosmology by reducing uncertainties in distance measurements. By determining the key parameters needed for distance fitting (light-curve width and maximum luminosity), K2 observations will improve the precision of distances that are used for H0 and constraints on dark energy. Moreover, traditional ground-based supernova searches tend to find most supernovae only at or past maximum light. In contrast, K2's continuous high-cadence observations will capture the early phases of events. There is clearly a tremendous amount of information about the explosion contained in the early rise of the light curve. For example, for Type II supernovae these curves may reveal the shock breakout (see figure below). For Type Ia supernovae, the data may help elucidate the unknown trigger mechanism. For example, if a mass-losing companion star is present, then when the expanding material from the supernova hits it, extra shock emission will be evident (e.g. Kasen 2010). That emission, occurring in the first several days and dependent on viewing angle, requires early and continual observing of many supernovae to clearly define the circumstances of the shock and discover the progenitors of the events. The K2 Supernova Cosmology Experiment will deliver a statistical sample of such observations. Figure: Lightcurve of the Type II supernova KSN 2011a that was observed in the original Kepler field. 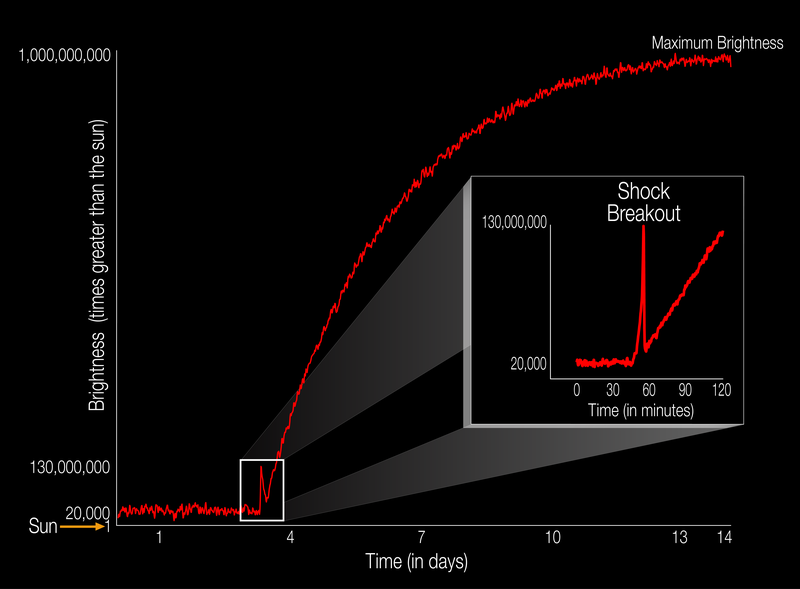 The lightcurve showed an early flash of light known as the shock breakout, thought to occur when energy traveling from the core reaches the surface during the early stages of a supernova. See Garnavich et al. 2016 for more details on this event. exploring synergies with other space missions, wavelength regions, and science areas. This will be an unconference-style meeting with a limited number of introductory talks and a strong focus on participant-led breakout sessions. There will also be time for writing observing proposals, drafting a white paper, and hands-on K2 data analysis. The goal of the first day will be to review the science that can and should be done, and identify the resources available. The goal of the second day will be to plan the K2 supernova experiment in detail using free-from unconference sessions. Technical (systematic errors, infrastructure, SNCosmo, etc). The goal of the third day will be to capture the outcome of the workshop by continuing work on the observing proposals, drafting a K2SN white paper, or carrying out hands-on analysis of existing K2 data. Hands-on analysis of existing K2 data. The workshop will take place at the NASA Ames Conference Center (Building 152), in Mountain View, California. Access to the NASA Ames requires a valid form of ID to be shown at the main gate. Non US-citizens will be required to pick up a badge at the main gate and need to register before January 9th for this reason. The nearest airport is the San Jose International Airport (SJC). The nearest alternative to SJC is San Francisco International Airport (SFO). We recommend hiring a rental car or using the Uber or Lyft apps for transportation from the airport. Building 583 offers double or twin beds without tv or airconditioning at $55/night. Bookings need to be made by phone on +1 650 603 7100, mentioning you are a participant of the "Supernova Workshop" at the conference center. You will need to provide a credit card number along with your name, cell phone number, and email. The workshop secured a block-booking of 25 rooms in Building 19, which will be made available on a first-come, first-served basis. Book early to avoid disappointment. Alternatively, the conference center provides a list of local hotels. Those nearest to Ames are the County Inn and the Hampton Inn & Suites. These options are more expensive but are located closer to downtown Mountain View, which provides ample restaurant options.